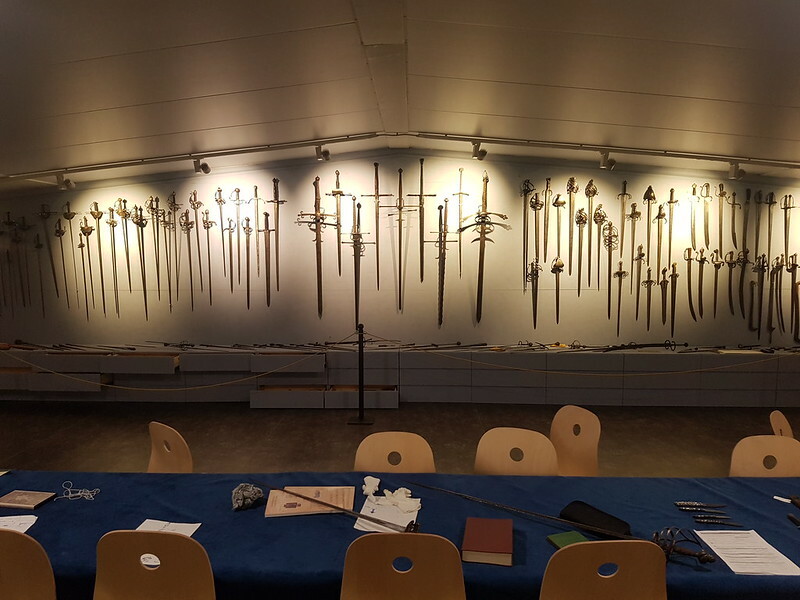 A little more than a week ago, I was arriving in Italy to the sala of Roberto Gotti for a special gathering of swordsmen called Giocatore. This was a weekend of martial encounters across disciplines, opportunities to share knowledge, and time to immerse oneself in study and camaraderie. Gairethinx in the Lombard language means “Meeting of Spears”. It was a gathering where military law was presided over and set. It seems a fitting name for the martial meeting place that Roberto Gotti has created in Botticino, Italy, a small town just outside the city of Brescia. Gairethinx, as a school, is a blending of the contemporary and historic. It has a modern training floor flanked by traditional Roman statues. 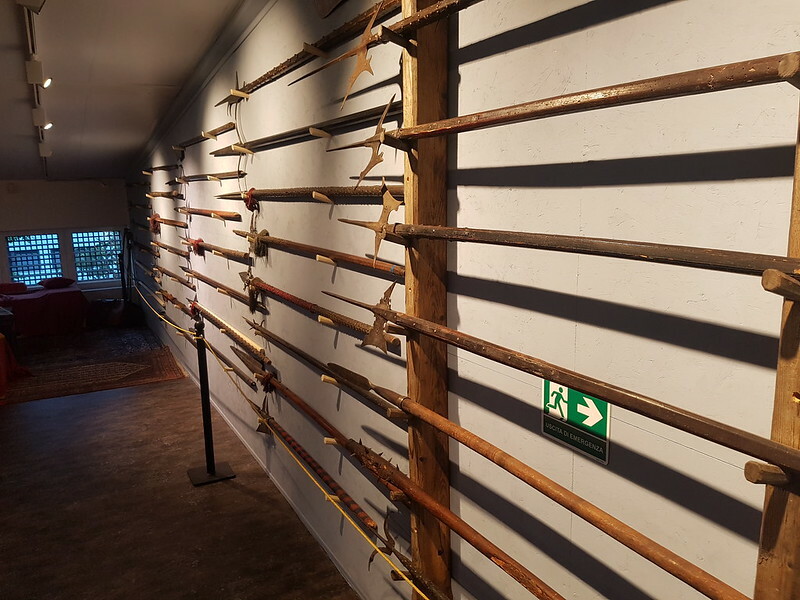 Neatly arranged stands full of modern training feders are a floor away from a museum with over 100 antique weapons, and classes through the week are held for both HEMA practitioners and modern fencers. It is this blending of old a new and the presence of so many great resources that make it a perfect place for an event like Giocatore. A Historical Blacksmith. 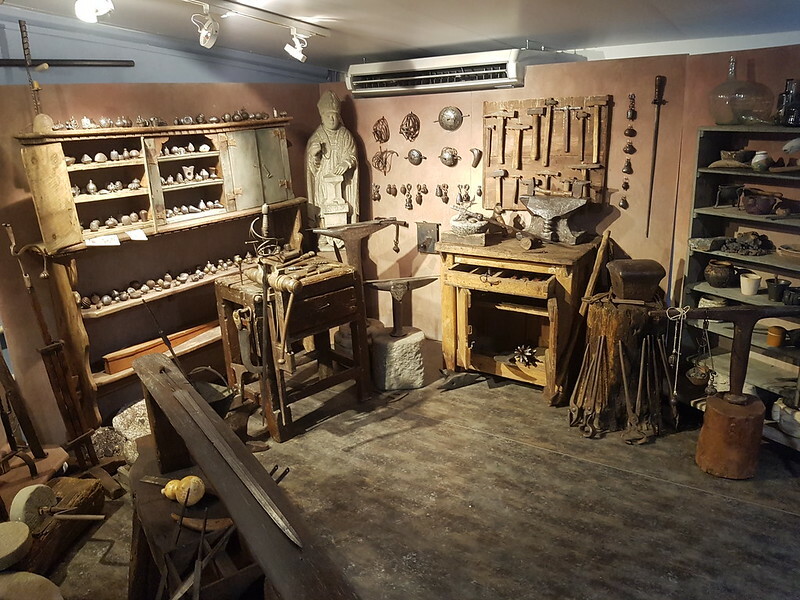 Featuring antique pommels and blacksmithing tools. 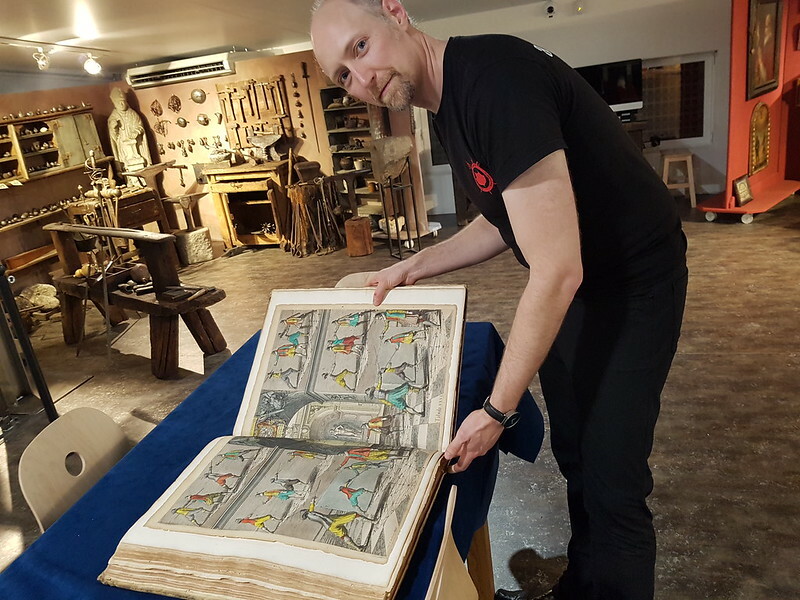 Fencing Master’s Study Display. 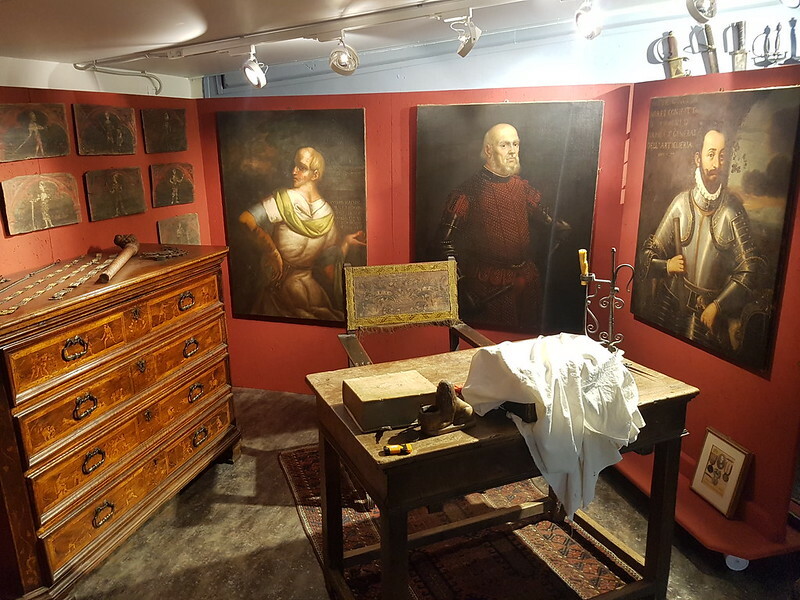 Featuring Renaissance paintings, a desk that has plates from Agrippa’s manual, and plates from the ceiling of an old fencing hall. The Gairethinx Training Floor, viewed from their lounge. Also be sure to check out the Duello.TV Livestream tour. Giocatore, meaning “fencer”, was started by Chris Chatfield of Brighton’s 1595 club. The goal of the event was to create a place for like-minded and experienced practitioners to meet and spend a weekend doing all the fencing they could handle. This past weekend featured boxing, sabre, sidesword, rapier, longsword, grappling, and more. Disciplines intermixed and a lot of exploration was done. The overall level of practitioners was excellent and, though it was an intimate group (by design), attendees came from all over Europe. I had the good fortunate of meeting Alberto Bomprezzi, Ton Puey, and Oscar Torres Carrasco from Spain, Thibault Ghesquière from Dijon, a great crew from 1595 club, many groups in England and Italy (Chris, Matt, Ben, Jaimie, George, Luca, and more), and fantastic fencers from Roberto’s own organization (including Roberto himself, who is most enjoyable to fence against, as well as the excellent Moreno and Jacopo). I enjoyed matches with nearly all the weapons present as well as many inter-disciplinary encounters. I fought till I was too tired to do more, then did a little more, then enjoyed drinks and great company afterward. Over the years I have come to prefer this kind of event. It provides the opportunity to be challenged by fencers from different backgrounds and in different disciplines but in a way that allows for a greater amount of fighting and exploration than a typical tournament. It also allows for a focus on martial soundness rather than scoring points, something I celebrate greatly as a martial artist now. On July 28–30 the second Vancouver Martial Challenge will be taking place at Academie Duello. This event is focused on two events: 1. The accolade tournament, that spans the entire weekend, where participants fight as many others as possible and vote each day for the most skillful, fierce, and honourable. 2. The martial challenge where participants set and face personal challenges such as pre-arranged matches and personal combat challenges. If the idea of an event focused on martial excellence, control, and the joy of sparring is of interest to you, check out our event details on-line, and join us in July!